More homeowners in our area are opting for Great Rooms. Rather than merely furnishing the Living Room with the standard couch, love seat & entertainment center, Great Rooms are multi-purpose spaces designed for entertaining, studying and family gathering. Adding a new room to your house not only increases your living space, but a well-planned and professionally executed home addition will add value many times over cost. Boost your home value and add valuable square footage. 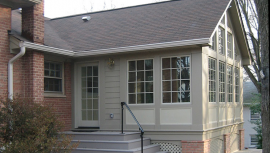 Kuzma Construction will expertly develop a plan and complete the work in sequence. Houses get old. Families grow. Sometimes adult children come home or the In-Laws move in. Families make adjustments. Home improvements are going to add to the quality of your family life. Rooms can often be added within the existing footprint of your home by utilizing 2-story great rooms or by creating a bonus room over the garage. Rooms can be added by increasing the footprint of your existing home. Our Team can plan, design and build an extension that seamlessly matches your existing house and provides the extra space you need!